Helping your body to function at its top level so that you feel your best and live the life you love! My education started in chiropractic, learning to adjust the spine and joints throughout the body. This was a great tool, but I felt like I needed more. I decided to get my Masters in Sport Rehab so I could dive deeper into prescribing the proper exercises and rehabilitation to help people recover from injuries. I got certified in Active Release Techniques. ART gives me tools treat muscles, ligaments, and peripheral nerve entrapments. This works great to provide relief and healing for sprains, strains, and injuries, including repetitive stress injuries, but I felt that I was still missing a tool to treat other chronic aches and pains. I took continuing education in nutrition and learned how the Standard American Diet (SAD) promotes inflammation in the body that leads to hundreds of conditions. WOW! This was a game changer for me. I changed the way that I eat and the way that my family eats. If you let me, I'll help you change the way you eat too! What I learned about nutrition led me to create the Wellness Warriors 7 Week Online Nutrition Boot Camp. I wanted people to really understand both HOW AND WHY they should change their eating habits. I had more information than I could share during an appointment at the office. I created the Wellness Warriors program, and people are getting great results. The Wellness Warriors program has helped lots of people with lots of problems, there are still some people that need more. This led me to sign up for a year long comprehensive training program in functional medicine! I am loving it! This is giving me even more tools in my toolbox to help you, your friends, and your families to live happy and healthy lives! In functional medicine, the body is seen as an interconnected whole within a larger environment. We recognize that in order to treat one part of the body, all of the other parts must be considered. It looks at underlying phenomena that occur across all of the specialties (like inflammation, oxidative stress, toxicities, cellular energy problems, etc.). The goal is to understand the root cause of the patient’s symptoms and to help them move toward health by fixing that. 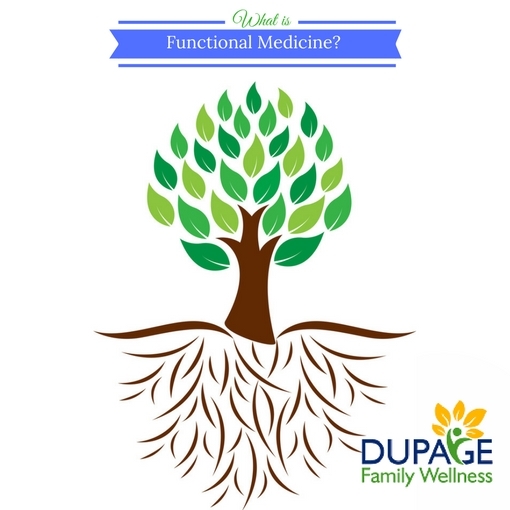 How is functional medicine different than conventional medicine? In conventional medicine, each system of the body is viewed as a separate entity. There is a doctor for the heart and cardiovascular system (cardiologist), one for the skin (dermatologist), one for the digestive system (gastroenterologist), etc. The goal of conventional medicine is to look at the overall symptom picture that a patient presents with in order to name a disease. Often the treatment is to find the corresponding drug to treat that disease. I heard an analogy recently that explained this difference very well. If you picture the 100 yards of a football field where the 100 yard line is having a full blown disease process going on, conventional medicine is great at diagnosing this condition at the 90 yard line. My goal, through the functional medicine perspective, is to see these disease patterns beginning (through various laboratory findings, inflammatory markers, etc.) as soon as the 10 yard line, and to help the patient to make the necessary dietary and lifestyle changes to reverse the disease process and return to ideal health. When is Conventional Medicine Best? There is a time and place for both the conventional and functional approach to medicine. Conventional medicine is great for acute illnesses and injuries. Some examples include Injuries (e.g. broken bones or cuts needing stitches) and infections (although they may be over-prescribed, antibiotics can save your life). If I were in an accident and was bleeding profusely, you better believe that I would be in a conventional emergency room having procedures done to stop the blood loss. When is Functional Medicine Best? For chronic conditions, the functional medicine goal is to find the root cause of the disease, rather than treating individual symptoms. For example, if you had high blood pressure, I would want to figure out what caused the high blood pressure rather than prescribing a medication that you have to take for the rest of your life to decrease your blood pressure. Although you might take the medication to keep your blood pressure under control for a period of time, the ultimate goal would be to find the root cause and reverse the condition and symptoms so that you could be weaned off of the medication. I chose a tree for today’s image because it illustrates the idea of getting to the root of the problem. The roots of many chronic disease processes are THE SAME because they all have a relationship to inflammation within the body!! Yes there are specific doctors and medications for all of these conditions, but they all have a link to inflammation and dysregulation within the body. This means that diet, movement, sleep, and stress are potentially at the root, and improving these behaviors can help with ALL OF THEM!! In my opinion, improving lifestyle choices is STEP ONE to a lifetime of ideal health and happiness! Sometimes this is enough. Other times, our bodies need a little more help in the healing process. This is where my functional medicine training comes into play. For those that have improved their diet, stress, sleep, and movement and need further help, we can dive deeper and analyze what is going on with their digestive system, hormone levels, nutrient status and more. I can order specific tests like blood, urine, stool, and hormone analysis to see what is really going on, and work with patients to develop a plan to fix it! I will take a much deeper dive into these specific tests and why they are important in future blogs.